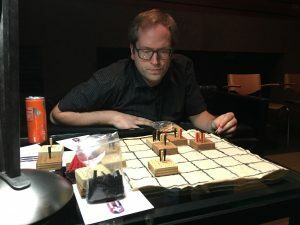 I wrote a forum post about Eigenstate over at Board Game Geek in the Abstract Strategy Game Forums. In the post I cover where I got the idea, how I made the original prototype, and a bunch about ideas that I tried to incorporate and didn’t work nearly as well as the current rules. Speaking of rules, I also posted them. In prep for all of this, I submitted a BGG entry for Eigenstate, and uploaded a few photos of it on my BGG designer profile. But the big news is that Adam from Adam’s Apple Games is planning to publish the game. This is obviously extremely exciting for me, as it’ll be my first board game to have a real box and print run. Eigenstate is a 2-player abstract strategy game with incredibly simple rules that grows in complexity as you play. Each turn you move a piece and then add two additional eigenstates (pegs) to your pieces giving them more possibilities for movement on future turns. Land on your opponent’s pieces to remove them from the board and when you’ve reduced them to one piece remaining, you win the game. As you can see from the photo above, each piece has 25 holes, and all but the center space correspond to a possible move for that piece (relative to the center). Each piece only starts with a single movement peg, facing forward. This design was a direct result of my playing a lot of The Duke and Onitama, and realizing that I wanted to make a game with similar movement mechanics. This was back in the summer of 2016, and at the time I was doing a project where I tried to come up with a new game idea every day. This game was the result of one of those ideas, and because of that project, I know the precise date I came up with the idea. 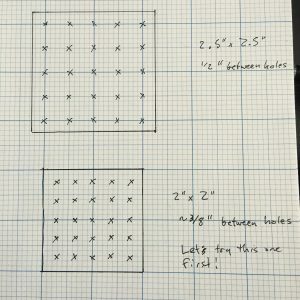 (2016-03-28, and it’s outlined in vague terms in this blog post) I wrote again about the idea once I’d built the initial prototype, (and started thinking about it as a game system) about a month later, on 2016-04-25. I’m extremely happy with the current simplicity of the game rules, but as usual, it took a lot of playtesting and experimenting to get there. 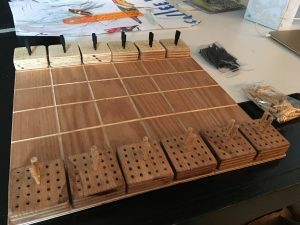 After the initial idea about pieces that gain additional movement possibilities over time, I had a lot of different ideas about how the game should play. But first I had to make a prototype. 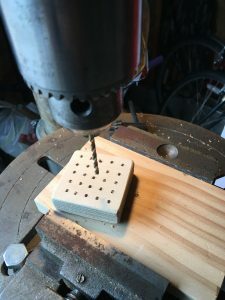 I bought some cribbage pegs online, and then spent a couple of afternoons in my friend Lloyd’s garage with his drill press. Once I had a physical prototype, I started playing versions of the game wherever I could, often with pretty wildly different sets of rules. Ideas that were interesting, but didn’t quite work included: allowing piece rotations; action point allocation for placing pegs and moving around the board; using the checkmate mechanic from Chess; using different colored pegs for different movement mechanics; recycling (repurposing) the pegs you capture from your opponent; forcing your opponent to put pegs in their remaining pieces when you capture one (with the end-goal to make them fill up a piece); and all kinds of ideas related to scoring based on the number of pegs in your control. Some of these were more complicated than others, but all of them resulted in a far more complicated game than the game as it exists today. 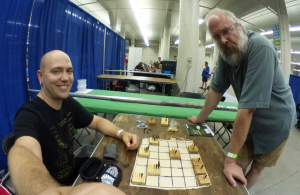 Notably, in this period of floundering around, I sat down with Patrick Leder (at GlitchCon a local game development conference here in MN), and also Nick Bentley (at Gencon 2016). I don’t think either of them were all that impressed, and around that time, I basically shelved the game for about a year after that. In the summer of 2017, I signed up for a table to show my games at the Twin Cities Maker Faire. Most of my games are for touchscreens, so faced with the prospect of a 10-foot table mostly empty but for a couple of phones and an iPad, I decided to lay out Eigenstate. This meant I had to explain it to people very quickly. Without referring to my notes, and pretty much off the cuff, I decided on the simplest possible rules I thought would produce a playable game. Essentially you only needed to remember to do two things on your turn, move a piece, and place some pegs. (I decided on two.) It was just piece elimination, the easiest possible win condition to explain. I’d playtested variations on each of these rules separately, but never in that combination, and again, always as part of a more complicated ruleset. I was a bit surprised by how well the game played with those simple rules. The game was played a bunch of times throughout the day, with really positive reception. I think if there is any part of the design I’m still looking for specific feedback about, it’s the victory condition. Capturing your opponent’s pieces is fine, but it doesn’t feel very unique. In quantum physics, the term eigenstate refers to the possible movement of a particle. It’s a bit more complicated than that, of course, (and honestly, I have only a slippery grasp on the concept), but once I hit upon quantum physics (and in particular using the uncertainty principal as a metaphor for movement in the game), I began hunting around for suitable quantum physics terms. I think there’s a cool extended metaphor about each of the pieces being particles in a system, and the players competing to observe their opponent’s system first. How moving your own particles (pieces) helps you observe that system is left as a thought exercise for the player. It’s worth noting that the rules as written don’t really reflect this metaphor, and I’m not sure they will (other than some flavor text) in the final version. As with the idea itself, I know when I came up with the name, on 4/26/2016. I am very pleased to be able to announce that Eigenstate is slated for publishing by Adam’s Apple Games. Adam has already 3d printed some additional copies of the game, and it’s being playtested internally. It will probably get a kickstarter later this year sometime. For years I’ve been a very vocal proponent of the Experimental Gameplay Workshop at GDC. This year’s session hit the internet quite fast (over on the GDC Vault), and I consumed it last night. As usual, I’d definitely highly recommend game designers and developers give it a watch. 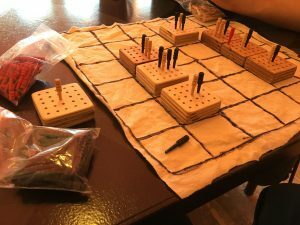 Baba is You, Arvi Teikari – A sokoban-like game where the rules of the game are also pushable blocks, and can be rearranged. Untitled Goose Game, Nico Disseldorp & Stuart Gillespie Cook, House House @house_house_, A game where you play as a goose and interact with your environment and an AI controlled gardener to complete objectives. Everything is going to be Okay, Nathalie Lawhead @alienmelon, This is an art game, or “an interactive zine”, that focuses on using humor to confront modern horrors. Noita, Petri Purho Nolla Games – An action rogue like game where every pixel is simulated, which means they are both destructible and have real-world (and fantastic) properties. Time Watch, Balthazar Auger and Lucas(?) from NGD Studios @ngdstudios – A FPS that allows you to play a single death-match three (or more) times, all the while altering causality. Feng Shui, Saúl González and David Marull from Ludopia @LudopiaNet – A puzzle or architecture game allowing you to place furniture in a room and incorporating the principals of Feng Shui. Luna, Robin Hunicke and Brad Fotsch of Funomena @funomena – Luna is a VR game with music and flowers. Freeways, Justin Smith from Captain Games @manbearcar – A game about drawing freeway lanes and making efficient paths. La Tabla, Chaim Gingold and Luke Iannini @tablaviva – An open source table and projector combination with lots of exciting possibilities for interaction and play. Of these, I was most surprised by Baba is You. It won two IGF awards, so I guess I wasn’t the only one. I have already downloaded the game jam version from Itch, and played through all the levels. I am definitely going to pick up the full thing when it launches on steam. I have also been following Dynamicland when I can, and I’d be interested in hearing about the relationship between La Tabla and it. I know that some of the people involved are or were involved in both, but that’s about it. Maybe I can interrogate someone about it at Eyeo Festival in a couple of months. La Tabla is on github, and I’m pretty tempted to put together a table so I can play with it myself.